These mini apple beanbags in the classroom could create a lot of fun and a whole lot of learning! Making them is quick and easy and they last for a very long time. 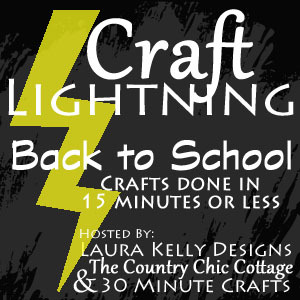 They are a perfect project for Craft Lightning. I am so honored to be co-hosting this week and have been so inspired by the projects so far. You can check them all out here…Yep, that’s right, it is day FOUR. If you missed out, you can still check out days ONE, TWO and THREE and FOUR! I made these with felt from Kunin, my sewing machine and Fairfield’s Poly-Pellets. They are so fun to make stuff with. I cut the apples out with my Ellison Superstar machine and used my apple die from the calendar collection then sewed two together and stuffed them. Easy peasy. I added extra felt and buttons on them to decorate them like I did for the chair pockets from earlier this week. They are so fun and there are so many ways they can be used! Here are ELEVEN great ways to use them in the learning environment, whether in a school or at home. See who can walk across the room with the bag on their head the farthest and chart results then compare and contrast. And that wraps it up for today! Which one of these projects are you making first? Doing the Apples for my granddaughters, don’t have the die cutter, but will cut by hand. Also the box top card. I save them all and they(my grandkids) share them. So this would be cute to give each one their own card with their box tops in it! Thanks for the cute ideas!